Baton Rouge, La.–Building an oil pipeline is already a complicated engineering project, requiring precision in everything from the grade of the earth to the quality of the welds to ensure safety. Building an oil pipeline in a delicate and difficult to access area like the bayous of Louisiana is even more difficult. In the bayou, Energy Transfer Partners is taking additional steps to minimize the impact pipeline construction will have on the area, according to officials with the company. Pipeline construction occurs in roughly thirteen steps with safety inspections and environmental impact mitigation efforts occurring alongside the building. Workers first survey the ground, clear the ground, and prepare the grading before welding and bending pipes into the appropriate shape, digging a trench, and finally placing the pipe. After the pipe is placed, the workers continue to test the line and clean up the area. A horizontal directional drilling rig, showing both its control booth and external diesel generator. For a project like Bayou Bridge, what this looks like can vary significantly depending on the type of ground the pipeline is passing through. For pipeline construction in an agricultural area, for example, the company says it consults with neighboring farmers in the early stage of the acquisition process to learn the condition they would like the easement left, for example covering it with sod or native grasses. In these areas, topsoil conservation is a key concern. Preventing the topsoil and subsoil from mixing during the construction project helps to allow for regrowth. Although trees and even large shrubs have larger root structures that could damage the line, grasses and smaller plants help to hold the soil in place, preventing erosion. They also use special equipment to decompact the soil. “It’s kind of like aerating your lawn, but on a much larger scale,” he explains. One particularly challenging part of the project is the 26 miles of pipe that will be laid inside the Atchafalaya basin. These bayous are difficult to access and environmentalists are concerned that construction could harm the delicate ecosystems present. 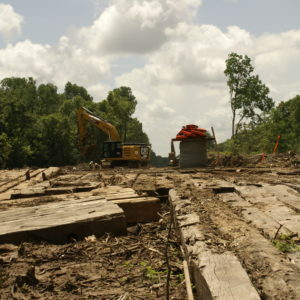 Within the Atchafalaya basin, the restoration process is even more involved. In order to have enough space for their equipment, the company had to clear a wider temporary easement. During construction, their equipment rests on “mats,” timbers 8-10 inches thick, which keep their treads from tearing up the soil. As the pipeline is completed, these mats will be removed. After construction is complete, this area will be allowed to regrow, through the ground over the pipeline itself will be kept clear of tree growth. Once the pipeline is operational, the company says it will use a variety of sensors to continually monitor pressure, temperature, density, and flow at various points along the line. Fluctuations in any of these readings is a sign that a portion of the pipe may be damaged or compromised in some way. Different sensors will report data every fifteen seconds to fifteen minutes, giving engineers at the control center a real-time picture of the line. In addition, the company plans to inspect the site from the air once a week.